Béyonce performs onstage during the 2018 Coachella Valley Music And Arts Festival. Mere days after Coachella 2019 — where the specter of Beyoncé's grand performance last year loomed large — Bey premiered Homecoming: A Beyoncé Film on Netflix. But, ever the generous queen, Beyoncé offered up a worthwhile supplement. A live album showcasing more than 90 minutes of the more than two-hour performance is out now. Covering 40 tracks — which comprises a vast bricolage of her own discography and others' — it features her cover of Maze's "Before I Let Go," her cover of "Lift Every Voice and Sing" and Blue's own take of the black national anthem. "Whereas other artists are chosen to headline a festival or perform at the Super Bowl, it's as if Beyoncé chose Coachella," Sidney Madden of NPR Music says. "She created an entire world to encompass the music that she's put out over the last two decades of her career. " 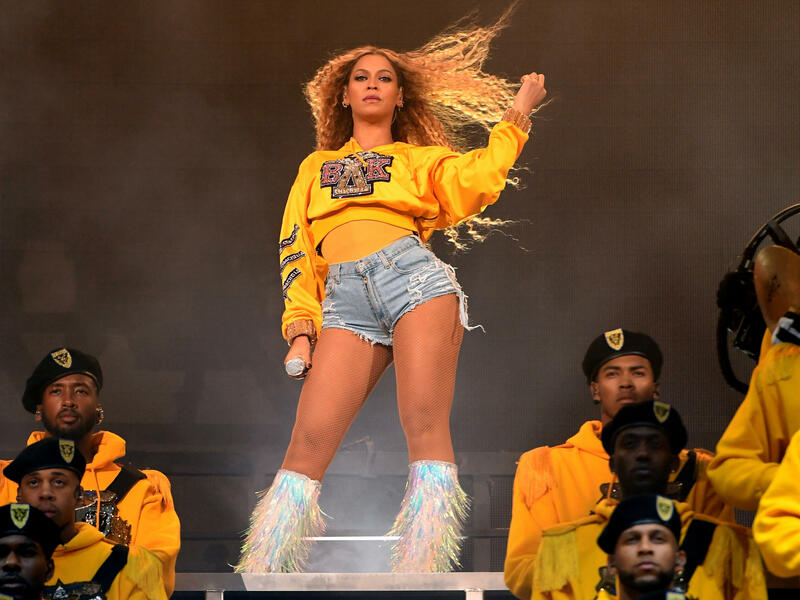 Queen Bey's 2018 Coachella performance was a love letter to historically black colleges and universities and black culture writ large even though, as Bey says in the docu-special, she never got to go to one herself. "She's always had a love affair with what HBCU's have represented and the type of culture that they've nurtured in the black community," Madden says. In Homecoming, larger-than-life performance shots are offset with intimate, black-and-white rehearsal clips which took place four months before the April 2018 set. As Bey and her brigade of dancers — sometimes including her daughter, Blue Ivy — rehearse steps, voice-overs are overlaid from historical figures like Maya Angelou and Malcolm X. "It's all to give you her point of view, her mind state, into what she was trying to accomplish and communicate with this momentous two-hour performance," says Madden. For what it's worth: Lemonade still is not on Spotify, so for subscribers, this might be the best way to hear "Formation," "Hold Up" and "Freedom," among other interspersed Lemonade tracks. It came to be known as Beychella. UNIDENTIFIED ANNOUNCER: Ladies and gentlemen, welcome to Beyonce homecoming 2018. CORNISH: Last year, Beyonce became the first African-American woman ever to headline the Coachella Festival. Today, she's out with a documentary on Netflix called "Homecoming" about the making of that historic performance. Now, because she is Beyonce, she's also released a live album. Here to talk more about the latest in the Beyhive is NPR Music's Sidney Madden. Welcome to the studio. SIDNEY MADDEN, BYLINE: Thank you, Audie. CORNISH: All right. So just to set the stage, so to speak, there are a lot of other concert films out there, right? The genre goes back decades. What do they typically look like? MADDEN: It's a strong lineage of behind-the-scenes concert films that have basically brought it down to a science of what a behind-the-scenes concert film is going to feel like. You know, there's months of prep on choreography. There's moments of apprehension and struggling. And then, of course, there's that prayer circle scene right before the big show where everybody just pulls all together and it's totally triumphant. It's a pretty standard storyline at this point. CORNISH: So what is different about this film from Beyonce, which I gather she directed? MADDEN: Yeah, she directed it herself. Whereas other artists - they're chosen to headline a festival or headline a performance and they're like, oh, I'm going to show off the best of my career, for Beyonce, she created an entire world to encompass the music that she's put out over the last two decades of her career. So this entire performance was a love letter to HBCUs and black culture. CORNISH: And this is historically black colleges and universities. MADDEN: Absolutely. And even though Bey herself did not go to a college, she says in the film she's always had a love affair with what HBCUs have represented and the type of culture that they've nurtured in the black community. BEYONCE: And I always dreamed of going to an HBCU. My college was Destiny's Child. My college was traveling around the world, and life was my teacher. MADDEN: She took this opportunity, and she turned it into a statement of black excellence. BEYONCE: (Singing) I see it, I want it. I stunt, yellow bone it. I dream it, I work hard, I grind till I own it. CORNISH: It seems like she's also trying to put to bed any speculation about what her performance may have been about. Often, people talk about her. CORNISH: And, like, is she trying to say something about being black? I'm not sure. In the movie - right? - there are actual voiceovers from famous black and civil rights activists and writers. MADDEN: Yes, you have voiceover clips from Malcolm X. You got voiceover clips from Maya Angelou. MAYA ANGELOU: What I really want to do is be a representative of my race - of the human race. MADDEN: It's all to give you her point of view and her mind state of what she was trying to accomplish and trying to communicate with this momentous two-hour performance. CORNISH: Why do you think that is? MADDEN: I've had this debate, I'll say, with many people before when people want to bring up stats about how she's not the bestselling or she doesn't have the most Grammys. But what people don't realize or they don't want to realize about Beyonce is she doesn't care about that. She's not here to break weekly streaming records. She's not here to rack up as many Grammys as possible because the accolades that everyone else aspires to are just little bonuses for her. She's here to create a cultural conversation and historical moments within the context of pop culture and music, and then everything else will just fall by the wayside for her. CORNISH: All right. Editor at NPR Music and Beyonce superfan Sidney Madden, thanks so much. BEYONCE: (Singing) You make me happy. This you can bet. Transcript provided by NPR, Copyright NPR.